April Showers? Find a Book! Rain is never fun. Well, almost never fun. 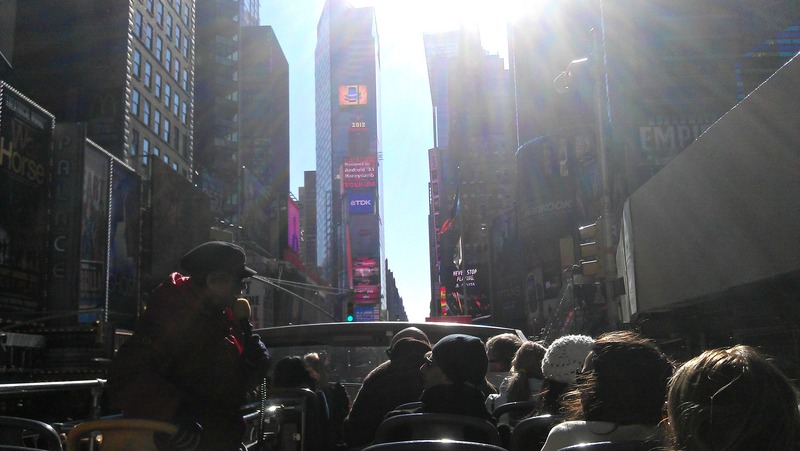 But if you’re only in NYC for a short time and trying to see the sights, it can really put a damper on your plans. The problem is it rains a lot this time of year. Personally, when it rains I like to cozy up on a nice chair and read a book. So why not do that if you’re a tourist? Reading a book might be the best way to see at least something worthwhile: the library. Like most things, New York does its libraries big. 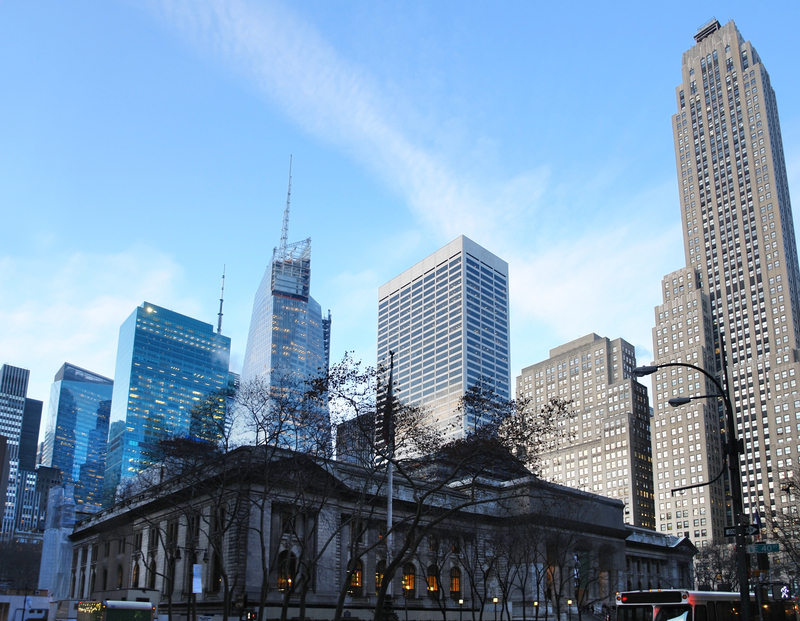 Many of the city’s most popular libraries are of the finest architecture in the world. 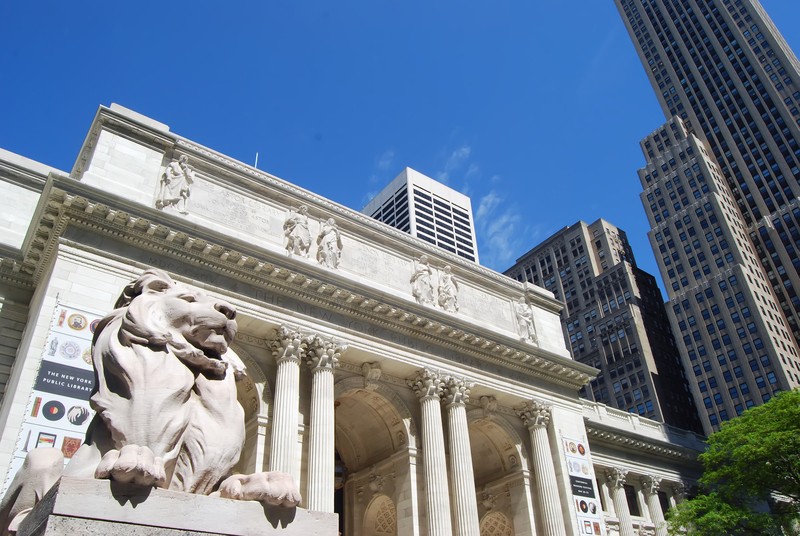 One of the most beautiful buildings in New York, in which you will certainly be able to find a book while you wait for the stormy clouds to pass, can be found just blocks from your favorite sights in Midtown Manhattan: The New York Public Library. To be fair, there are many NYPL branches throughout all five boroughs. It’s not just one building. But we’re talking about the Main Branch, located on Fifth Ave. between 40th and 42nd Streets. Protected by lions at the front entrance, the stone building stands along among some of New York’s most brilliant skyscrapers. Inside the Stephen A. Schwarzman Building (named after a benefactor who donated $100 Million dollars to its renovation) you will find books. Lots of books. 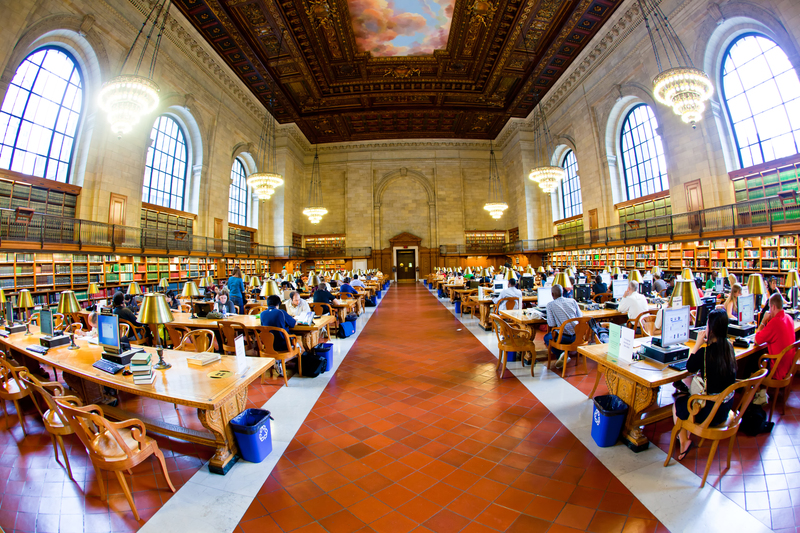 The New York Public Library System has the second largest collection of items in the United States, behind only the Library of Congress. The Rose Main Reading Room offers plenty of tables to work on a project or leisurely read some classic literature. The room is surrounded by reference pieces and lit almost entirely by its arching windows and dangling chandeliers. It is one of the most enchanting rooms in all of Manhattan. If you find yourself caught in the rain next time you’re in New York City, don’t worry. The Empire State Building may be surrounded by fog and Times Square may be filled with puddles, but at least you know that the library will be there for you. 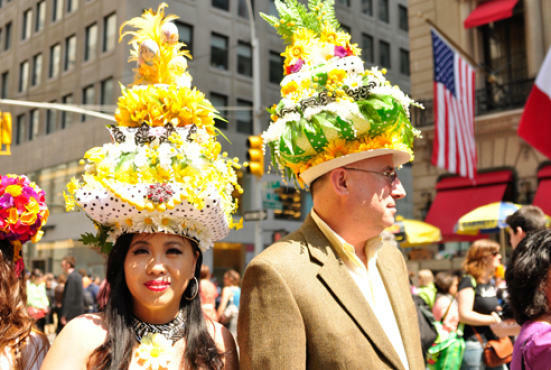 What: The NYC Easter Parade and Bonnet Festival is an annual tradition that takes place in Midtown Manhattan. This is one of the less organized parades that the city has to offer, but it is still loads of fun. Make sure you bring your favorite bonnet (extravagant hat) and celebrate with the crowd. Don’t expect any big floats or marching bands in this parade. The spectacle is featured around the outfits and bonnets of those who come, so it’s safe to say that the Snoopy balloon will not be making the trip down Fifth Avenue. *SPOILER ALERT* The rest of this article will feature moments from the television series Mad Men. If you do not want spoilers for season 1-4, you should stop reading now. La Grenouille – In season 3, key members of the British ad agency Putnam, Powell and Lowe make a visit to the United States before purchasing Sterling Cooper. They meet with Draper and the gang at La Grenouille, one of New York City’s finest French restaurants. As recently as two years ago, the New York Times has written a glowing review of the Midtown eatery. To enjoy this fantastic restaurant, Hop-off at Rockefeller Center and walk up 5th Avenue to 52nd Street. PJ Clarke’s– After Peggy Olsen successfully pitches her campaign to Belle Jolie in season 1, she goes out to celebrate at PJ Clarke’s with a few of her coworkers. They drink, they dance and have an all-around fun time at the old saloon. Still open today on 3rd and 55th, Hop-off at the Astoria=Waldorf Hotel and you’re just a few blocks away. Grand Central Oyster Bar – If you’re in the mood for seafood, you can Hop-off at the same Waldorf Hotel location and walk down Park to the Grand Central Oyster Bar. Don and Roger Sterling eat and drink themselves under the table in the season 1 episode, “Red in the Face.” Still to this day considered one of the best oyster bars in New York City, Grand Central has been open since 1913. Keens Steakhouse – Don and Pete Campbell head to Keens Steakhouse in season 3 to talk business over a couple of delicious pieces of meat. You can check out one of the finest steakhouses in all of New York City, just two blocks up from Herald Square. Hop-off at The Empire State Building stop for a short walk to a big porterhouse. Sardi’s – In Season 2, Don, comedian Jimmy Barret and his wife, Bobby head over to Sardi’s for a celebratory drink. Even though Don’s relationship with the Barret’s may have crumbled, Sardi’s is still going strong, in its 86th year of business. Located next to the St. James Theater on 44th, Hop-off at Times Square for a fresh Old Fashioned at Sardi’s. And of course, put on your nicest skinny tie, pour yourself a scotch on the rocks and enjoy the season 5 premiere of Mad Men, Sunday at 9pm on AMC. To hop-off at all of these locations, check out Gray Line New York’s Downtown Loop and don’t miss out! Dee and Nadeem took the All Loops Tour this week. If you want to take advantage of the same tour that they found so wonderful, stop by our website and book your tickets now! March is here, and if you’re a sports fan, this means one thing: Madness! The NCAA Men’s Basketball Tournament has already started, pitting 68 of the best colleges in the nation against one another to see who reigns supreme. There was no upset here, but you still have a chance to change that. Can Soho make a second half comeback? Go over to our facebook page NOW and vote for your favorite! Don’t forget to tell us why in the comment section. Did we miss your favorite hop-off location? Let us know! If you want to take one of our tours and see for yourself where the best hop-off spot is, be my guest. And don’t forget to tune in tomorrow when Rockefeller Center tries to take down Times Square! Go to a service or just visit for the architecture. One of the most beautiful Catholic Churches in the world, St. Patrick’s Cathedral has plenty to offer. 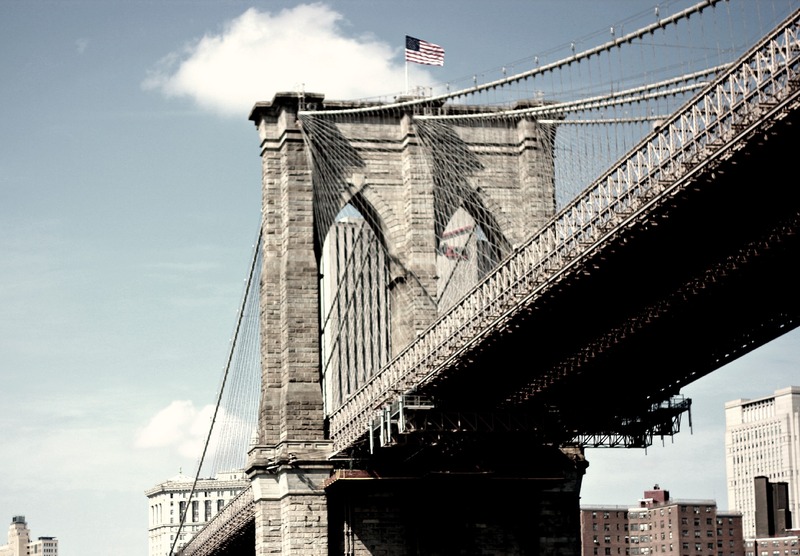 Take a stroll across the Brooklyn Bridge, the landmark built by many Irish American immigrants. Have you ever wondered what NYC is like on St. Patrick’s Weekend? Well go to the Top of the Rock and you can see the whole thing! With arguably the best view in Manhattan, it’s tough to find a reason not to go! On Sunday, March 18th, the Irish Arts Center will be holding a free celebration. From 12-5 p.m., all are invited to enjoy music, dance, culture and many performances. Of course we cannot leave this out. You have to go to the parade, even if just for a short while. It’s one of New York’s greatest traditions, so don’t miss out.